With the desire for Cowley College to have more of a permanent role in Sumner County and in particular, Wellington, KS, college representatives attended a meeting with the Wellington Area Chamber of Commerce and Sumner County Economic Development on Friday, September 18. Annarose White, Executive Director of the Wellington Area Chamber of Commerce, enjoyed meeting with Cowley College president Dr. Dennis Rittle, and said she is looking forward to an expanded Cowley College presence in Sumner County that will form unique partnerships with business and industry and schools. Along with Dr. Rittle, several school administrators were in attendance. Cowley’s representatives met with business and industry leaders from across Sumner County. They also met with superintendents and high school counselors from Sumner County, as well as representatives from the Wellington Chamber of Commerce and area economic development. The meeting began at 11:30 a.m. and ran until 3:30 p.m. The Sumner County Economic Development office provided lunch and the day concluded with a tour of GKN AeroSpace Precision Machining, Inc. in Wellington. GKN Aerospace Precision Machining, Inc. has been at aviation’s epicenter since 1966. The facility has 245,000 square feet of space and employs 220 people. Ray Lagpacan, Director of Human Resources at GKN AeroSpace, said the company welcomes the opportunity to partner with Cowley College and the local high schools on finding ways to develop future talent for its company and other industries in the area. “Our company’s continued success depends on having the skilled talent readily available to support our future growth,” Lagpacan said. 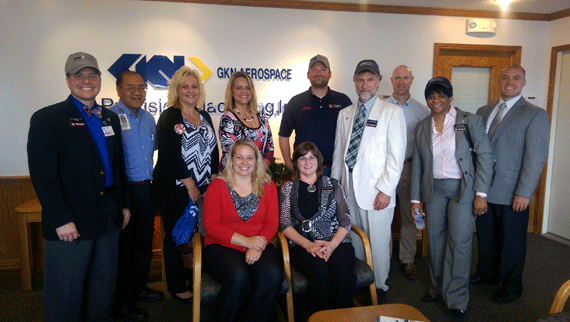 Dr. Rittle enjoyed the tour and was impressed with the GKN AeroSpace facility. “The tour gave our leadership team a taste of the needs and operations in Wellington,” Dr. Rittle said. White said the discussion and tour was a critical piece to Sumner County’s strategic plan of increasing the county population and quality of its available workforce in the area. She also said the renewed presence of Cowley College in Sumner County is invaluable. Dr. Rittle said the college’s desire is to have a much more substantial footprint in the Sumner County area. “We will do our best to develop those partnership which further economic development and also continue to provide educational opportunities to Sumner County,” Dr. Rittle said. White said she is still collecting information about what skills are most needed in the workforce. Companies, schools and manufacturers are invited to provide input to the Sumner County Economic Development office. Those pictured are, seated, from left, Annarose White, Executive Director of the Wellington Area Chamber of Commerce and Janice Stover, Cowley College Director of Academic Enrichment. And back row, from left, Cowley College President Dr. Dennis Rittle; Ray Lagpacan, Director of Human Resources at GKN AeroSpace; Stacy Davis, Director of Sumner County Economic Development; Stephani Johns-Hines, Cowley College Associate Vice President for Mulvane and Online Operations; Joe Clasen, Cowley College Career and Technical Education Department Chair; Dr. Harold Arnett, Cowley College Vice President of Academic Affairs; Deryk Ruddle, Cowley College Lead Parademic instructor; Dr. Gloria Walker, Cowley College Vice President of Finance and Administration; and Ben Schears, Cowley College Vice President for Institutional Advancement.